Native to the meadows and marshes of Europe the Marshmallow Root is, before we go any further, yes, the inspiration behind the puff balls of sugary goodness we like to toast on the camp fire. The pale pink flowers that blossom from this plant in summer do somewhat remind you of a pink marshmallow but it actually because marshmallow root extract was once actually used to flavour the sweets. When taken internally the marshmallow leaf can be used to treat inflammation and ulceration of the digestive tract as it soothes and softens tissue. The polysaccharides in the plant form a protective film over the irritated tissue. Cystitis and hiatus hernia are well treated using the root also. 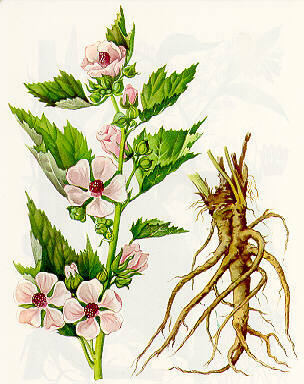 Externally marshmallow root has many beneficial effects for the skin. It can be used to treat burns, ulcers, abscesses and wounds. It does well to control bacterial infections, has great anti-inflammatory properties and boosts immunity at a cellular level. Marshmallow root also contains enzymes which reduce the degradation of connective tissue which means it helps to maintain moisture levels of the skin and boost dermal structure of the skin. Hence why you'll find this as an ingredient in many anti-aging products.